ALTHOUGH originally designed over two years ago, the Comper "Mouse," which has just been placed on the market by the Comper Aircraft Co., Ltd., of Heston Airport, and of which we are now able to give the first full details, ДальшеMore>>> is still a very modern layout. At the time of its first conception it was called the "Aircar," and this name is peculiarly apt, as it should fill the requirements of those who want something more than the high-speed touring car can give them. While the Comper Company was still at Hooton it was not found possible to go into production with this machine, and it is only now, when they have moved to Heston Airport, that the facilities available have been such as to warrant embarking upon its production. Naturally, during the intervening time, some detailed changes have been made in the design, but the basic layout and specification have remained the same. 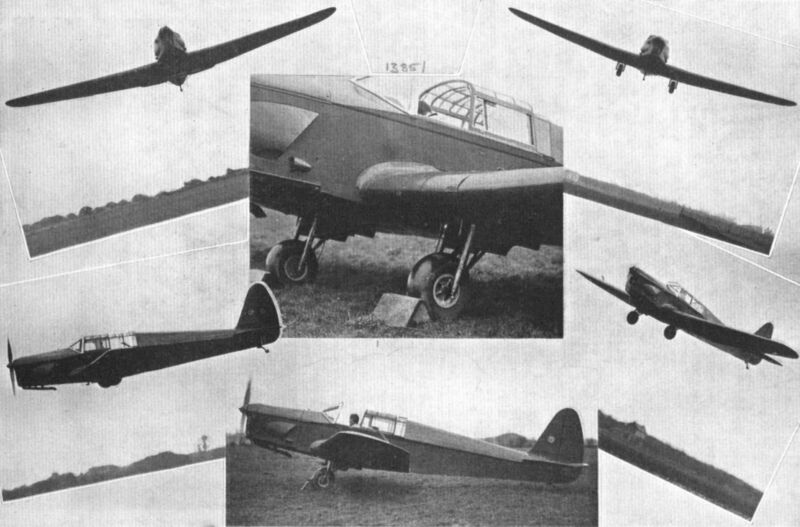 The "Mouse" is a three-seater, full cantilever, low-wing monoplane, driven by a single "Gipsy Major" engine rated at 130 h.p. The low-wing arrangement has of recent years found several adherents among our designers, where a high cruising speed has been desired without the disadvantage of a high landing speed. 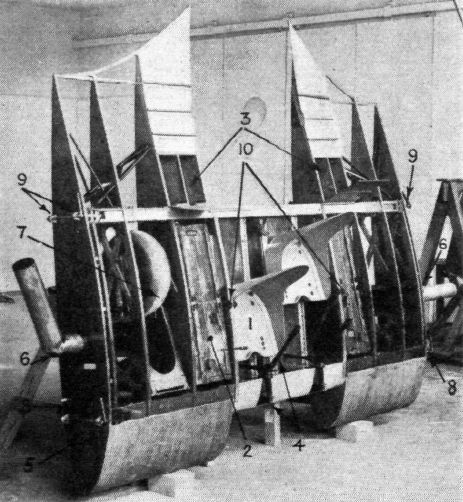 This layout certainly benefits from a form of air-cushioning when nearing the ground, and it would appear to mitigate to a considerable extent the disadvantageous interference between the wing and the fuselage, which in some designs accounts for a poor performance. Flt. Lt. N. Comper's new machine is designed to cater for both the private and commercial owner. The cabin is wide, allowing very comfortable seating, while at the same time providing more space for commercial pay load than is usually found. Throughout the machine there is evidence that particular attention has been paid to the demand for comfort. The luggage locker is large, holding three ample-sized suit-cases, while by an ingenious arrangement two lockers are provided in the wing roots, which are suitable for tools, log books, etc. The seating arrangement is very comfortable. The pilot does not sit alone in front, but has a choice of sides as the two front seats, which are both adjustable on runners, face full dual sets of controls, allowing the "Mouse" to be flown from either seat. The rear seat is a very comfortably upholstered one, right across the fuselage, and would, if necessary, give sufficient room for a child to be seated alongside the second passenger. Provision is also being made for light luggage, hats and so on, to be carried in a rack behind the rear seat. Having the front seat on sliding runners permits of many variations in the seating, so that when three persons are in the machine, one, not piloting, may either be forward where he can talk to the pilot, or aft where he is near the second passenger. Naturally, having side-by-side seating necessitates a fairly wide fuselage, but the nose of the "Mouse" is well formed, and the cowling over the engine does not hinder the view forward when the machine is in flying position. On the ground the view for taxying is not, perhaps, ideal, but this is more than compensated for by the fact that the cabin roof is so made that it can be opened in flight. It is, therefore, a simple matter to taxy with it in the open position and for the pilot to look out over the top. A feature which is as yet only found on the most modern machines is the retractable undercarriage. 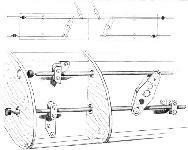 This is particularly simple, and, as can be seen from our artist's sketches, each wheel is carried in a rectangular pyramid of angle section steel. The springing is by a tier of rubber blocks above each end of the axle. 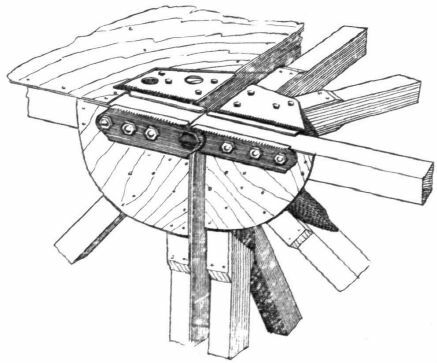 This bracing, enclosing the wheel and carrying the springing, forms a separate unit for each wheel, and is hinged about its foremost edge. 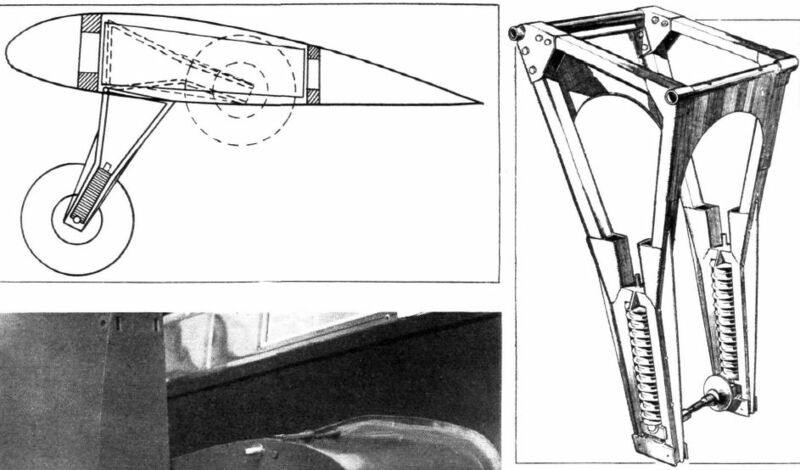 A lever system, worked by a hand lever in the cockpit, raises or lowers each unit in a negligible space of time. Aluminium cowling will, in the finished machine, be attached to the front of the wheel units, not only serving to streamline the unit when retracted, but conversely acting as an air brake when the unit is lowered. Many aeroplanes have, of recent years, been fitted with sliding cabin tops, but little attempt has been made to design a top which would be strong enough to be opened while in flight. The "Mouse" has this desirable feature, and is, therefore, comparable to a motor-car with a sunshine roof. There is an added advantage to this in that it will allow the pilot to put his head right outside in the case of necessity, and is also strong enough to give safety to the occupants should the machine be overturned. Structurally the "Mouse" is a straightforward wooden machine with rigid bracing. The fuselage is slab sided with fabric covering over spruce longerons and diagonal spruce bracing. It is built in three parts - the rear portion, the cabin section, and the engine bay. Plywood or steel plate "biscuits" of generous dimensions are used on each side of all fuselage joints where bracing struts come to the longerons. 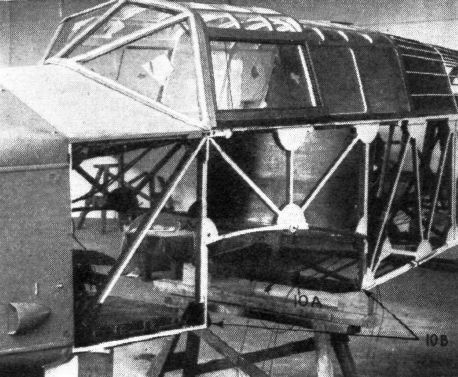 It will be seen from our photograph that in the forward part of the fuselage the bottom longeron is cut away so that the fuselage will drop over the bottom centre section of the wing and mate up with three attachment points, two on the longeron and one on a braced point in the centre of the bay bracing above. This wing centre section is interesting, as it is a separate unit and contains many special features. The two front seats are carried on runners between the spars, with the control columns in front of them attached to the front spar. Outside each seat there is a wing fuel tank of nine gall, capacity, and outside that again, still between the spars, is the space wherein the retracted undercarriage lies. The wing root is also unusual. The outer portion of the wing is attached to the spar roots by two screwed bolts which can readily be withdrawn when unscrewed by means of the folding head on each. In the middle of the aerofoil section is a large-diameter tube with an elbow joint in it. The inner half of this tube is rigidly attached to the wing centre-section, and the outer part of the wing slides over the outer part of the tube. The procedure when folding the wings is, after removing the wing bolts, to pull the wing out on the large tube, rotate it until the leading edge is downwards and then fold backwards. The wing spars are boxed up of spruce booms and plywood webs, while the ribs and the bracing are simple N or Warren girder trusses, of spruce and plywood. The leading edge is plywood covered and the remainder of the wing fabric covered. 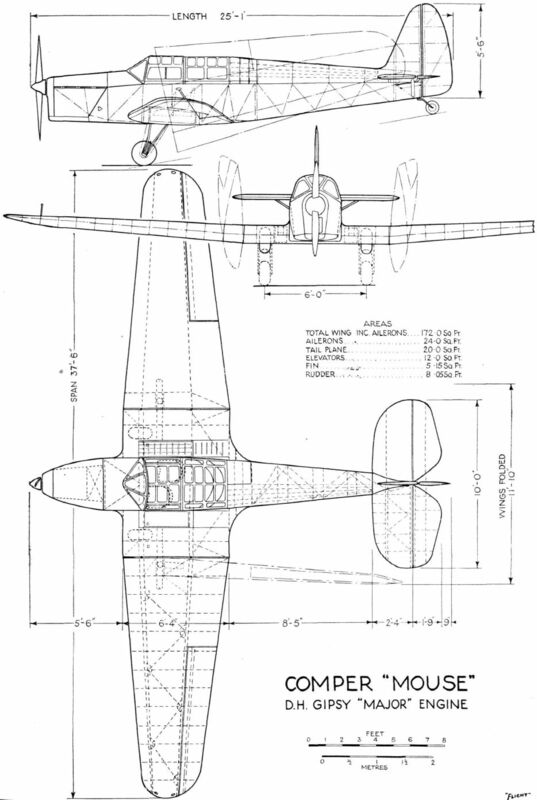 The ailerons are of the same construction, as is the tail plane, except that the latter has a tubular leading edge. The elevators have boxed wooden spars, with angle steel ribs and tubular bracing and trailing edges. The rudder is on a steel post with steel ribs welded to it and a tubular trailing edge. The tail wheel, which is free to swivel, is a small rubber-tyred wheel, carried in a spring-steel fork. The engine is carried on a welded-steel tube mounting carried from four bolts at the front end of the fuselage. Besides the wing fuel tanks, there is a 14-gall. gravity tank in the front of the fuselage The engine cowling is so arranged that the engine is perhaps more accessible than in any light aircraft we have seen. The side panels of the cowling, which are of well reinforced aluminium sheet, are hung on vertical hinges at the front ends. These can be swung forward and locked with a strut, while the bottom of the cowling can also be lowered on a transverse hinge, thus exposing all the features of the engine which require attention. The control system for the ailerons is worthy of especial note. This is by means of what may be termed push-push rods. At the point where the rods leave the centre section and enter the wing proper, they are broken and ended with rubber buffers. 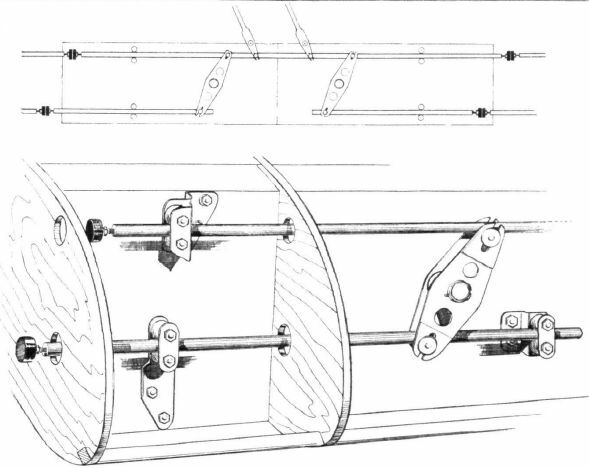 Two rods lead to each aileron, running between closely-spaced rollers. 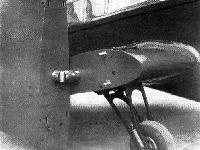 The buffers provide a means whereby the wing may be folded without in any way disturbing the aileron control mechanism. As the "Mouse" has not yet finished its full flying trials, it is not yet possible to quote actual performance figures. Actually, these have come out very satisfactorily, and there is every indication that they will surpass the estimated ones. The cruising speed, it is hoped, will be about 130 m.p.h., while the landing speed and take-off run are remarkably low and short. The cabin of the "Mouse" is light and airy, as it is fitted with a form of sunshine roof. The small locker in the wing root can be used for tools and log books. The luggage locker, as shown, holds three suit cases, which are supplied with the machine. The front view emphasises the clean design. 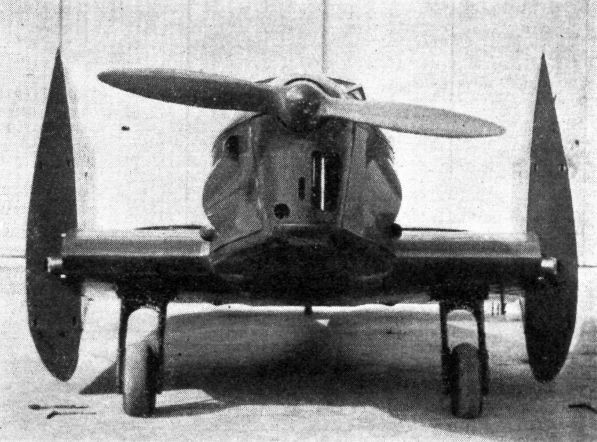 This front view show the neat design of the undercarriage. The clean engine cowling around the "Gipsy Major" and the small space taken by the "Mouse" when folded should be noted. COMPER "MOUSE" IN ACTION: These photographs, secured at Heston on Saturday last, give a very good idea of the latest Comper machine. Retractable undercarriage and "sunshine roof" are features of the design. The engine is a de Havilland "Gipsy Major." The pictures were secured just before Fit. Lt. N. Comper took the machine to Martlesham for its official tests. The centre section is built as a separate unit. 1, an adjustable seat sliding on runners. 2, the starboard wing fuel tank. 3, small lockers for tools and log books. 4, a control column, working the push-push rods which leave the wing at 5, where they end in rubber buffers. 6, the elbow joint upon which the wing folds. 7, an undercarriage wheel retracted. 8 and 9, the wing root spar bolts. 10, the centre attachment point for the fuselage. The front part of the fuselage drops over the centre section of the wing and is attached by three bolts at 10a and 10b. This shows the method by which the wings are folded on a central joint. Details of the retractable undercarriage. 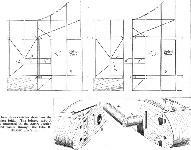 These three sketches show how the wing folds. The jointed tube A is anchored in the centre section and passes through the tube B. This explains the general structure of the wing. 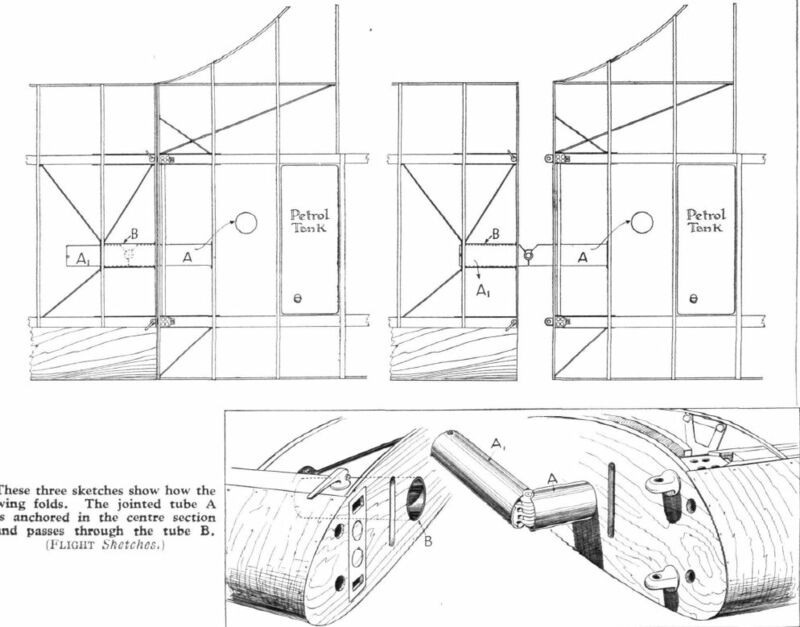 A sketch explains the action of the push-push rods for working the ailerons, while at the same time providing a system which does not have to be uncoupled when the wings are folded. The tail plane on the left has a boxed wooden spar with steel ribs. The rudder on the right is all steel. 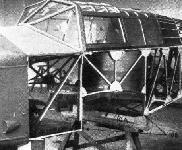 A fuselage joint between the rear portion and the cabin; large plywood biscuits and steel fish plates are used. 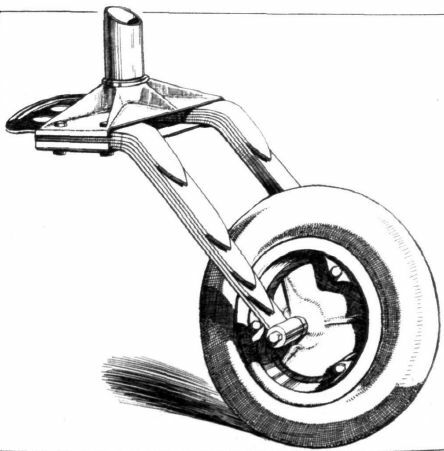 The tail wheel mounted on a spring steel fork.